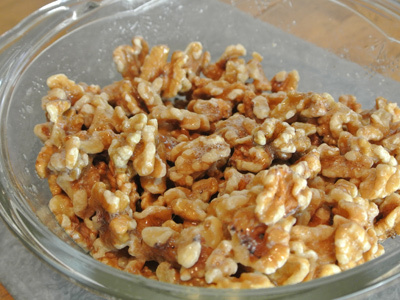 I know that candied nuts are usually thought of as a winter treat but they can be a great snack anytime. 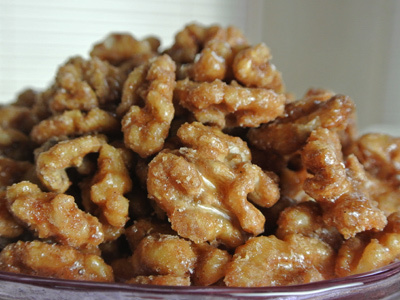 I was looking for something crunchy and sweet to put in a salad when I remembered an old recipe for candied pecans. The recipe called for sugar, cinnamon and a splash of vanilla but an inspiration hit me when I started gathering the ingredients and found my jar of Vanilla Sugar in the pantry. Vanilla sugar would pack a lot more flavor than a splash of vanilla and I could only imagine how it would smell and taste. If you’ve ever made vanilla sugar with split and scraped vanilla beans then you know how aromatic it can be. And as the walnuts begin to roast in the oven you might be reminded of the cinnamon roasted nuts you’d find at a farmer’s market or a fall festival. These turned out to be an irresistible treat. They provided a sweet crunch to our salad as well as a dessert topper for a scoop of ice cream. Next time I will have to hide any leftovers as no one could resist grabbing a couple every time they walked by. 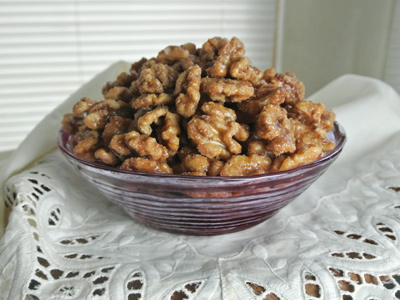 The original recipe called for pecans but I had walnuts on hand and they taste just as good. You’ll need 4 cups of nuts, 1 cup of Vanilla Sugar, 1 teaspoon salt, 1 teaspoon cinnamon, 2 tablespoons water and 2 egg whites. Whisk together the egg whites and water in a medium bowl. 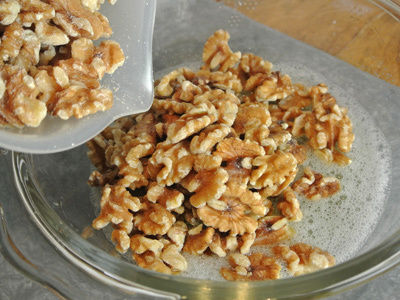 Add the walnuts to the mix. 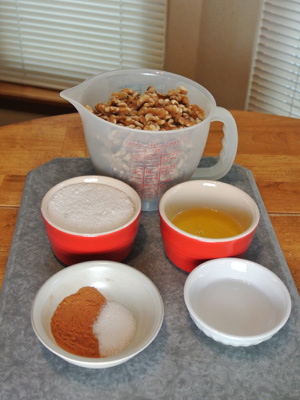 Stir until all the walnuts are coated with the egg white mixture. 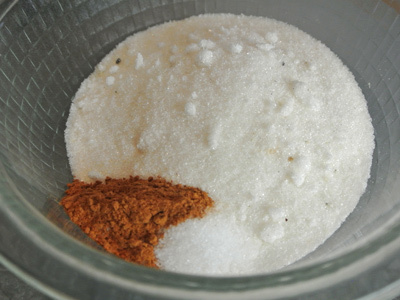 Combine the Vanilla Sugar, cinnamon and salt in a small bowl and whisk together. 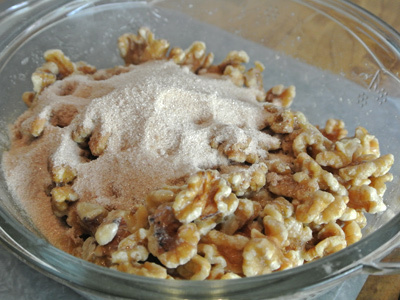 Add the sugar mix to the walnuts and stir. Line a large baking pan with aluminum foil. Spray with cooking spray and spread the walnuts onto the foil. 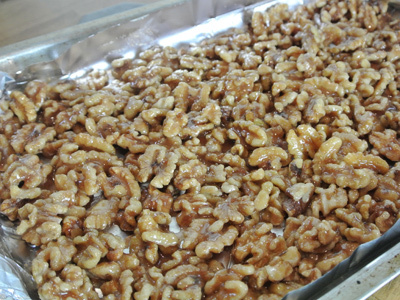 Spoon any leftover vanilla sugar glaze over the walnuts. Pop these into a preheated 225 degree oven for 1 hour. Stir every 15 minutes. They come out warm and glazed over with the most amazing aroma. Preheat oven to 225. 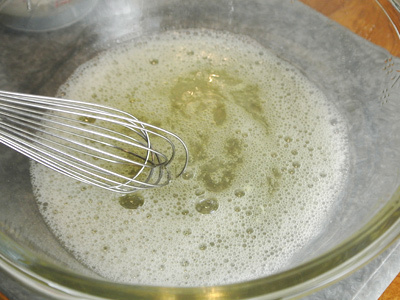 In a large bowl whisk the egg whites and water together in a medium bowl. Add walnuts and stir to coat. Whisk together the vanilla sugar, salt and cinnamon together. Pour over the walnuts stirring to coat. 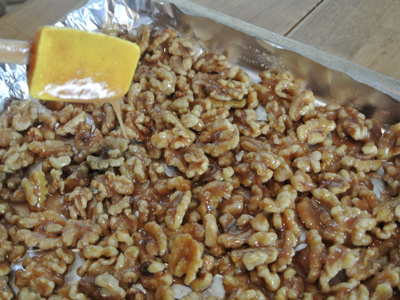 Spread walnuts on a baking sheet lined with aluminum foil that has been sprayed with cooking spray and bake for one hour, stirring every 15 minutes.